Filter installed in the gate system to retain exogenous and/or endogenous inclusions such as slag, foam or oxodic impurities (see Oxide inclusion) from the melt flow. 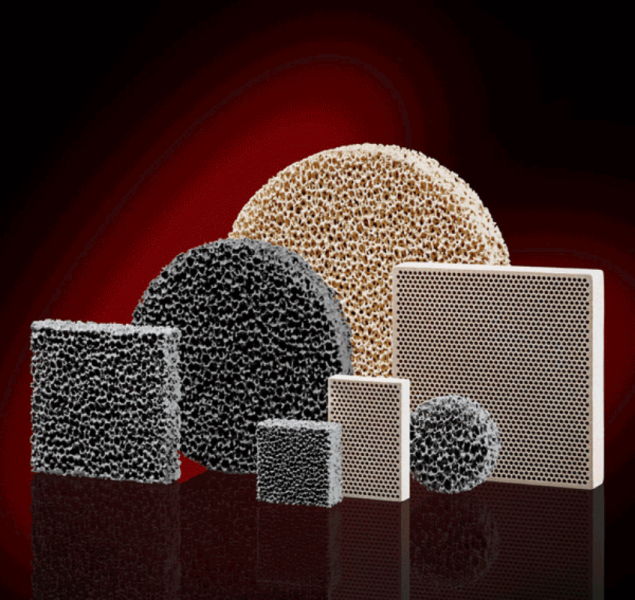 In general, ceramic filters are used, whereas a differentiation has to be made between ceramic foam (pore structure is generated by foaming) and cellular ceramics (pore structure is generated by pressing) (Fig. 1, Foseco Foundry Division Vesuvius GmbH). Another significant feature is the homogeneous pore size with cellular ceramics filters (extruded filters). Due to the production, an identical ceramic foamfilter pore size is impossible. Pore density is indicated as pore quantity per cm of filter length or ‑ commonly ‑ in ppi (pores per inch). Casting filters may also enable a metal flow homogenization and deceleration, i.e. turbulent flows are turned into laminar flows. 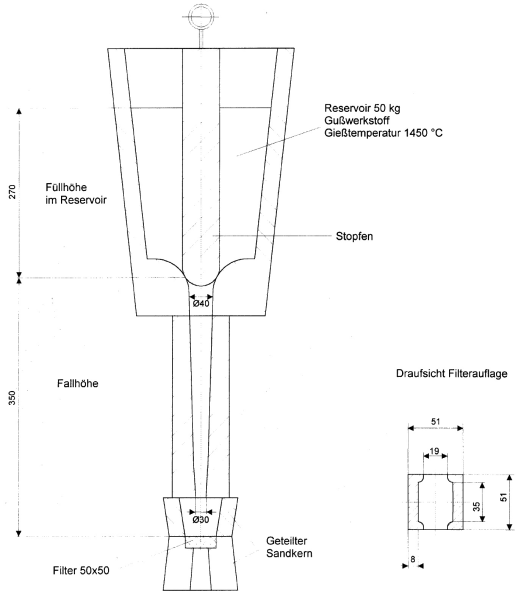 This results in significantly less re-oxidation within the mold and in a minimzation of the sanderosion risk (Fig. 2, Foseco Foundry Division Vesuvius GmbH). Depending on the purpose, zirconium silicate, zirconium oxide, silicon carbide and mullite are used as filter materials. The most common filter positions are vertical or horizontal in the gate system runner, in the upper sprue part or at them bottom of the sprue (see bottom of the sprue). Since the filter stress is relatively high for the positions mentioned before, not all filter sizes and porosities are suitable. Ideally, foam structure filters should be placed as close to the casting as possible. 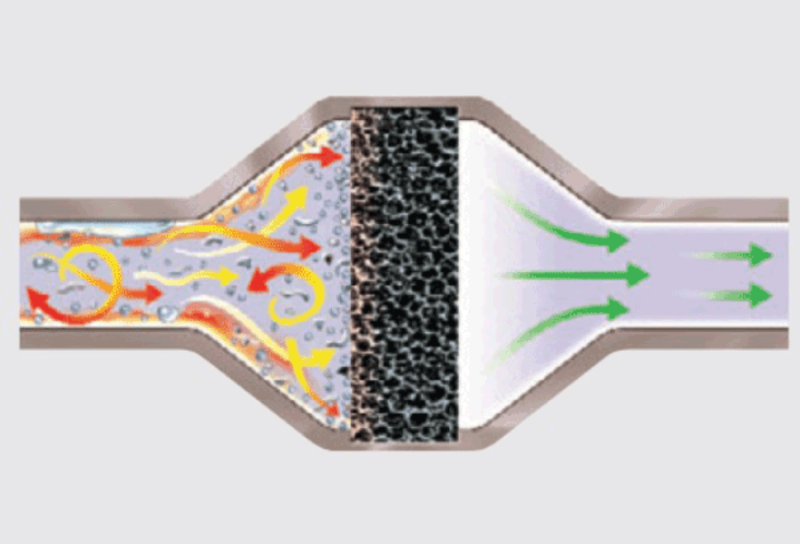 In any way, the casting system should be constructed without pressures and the narrowest cross section should be in front of the filter to avoid a “jet effect” (increase in flow velocity). With all filters inserted in the gate system, it can be seen that the thicker they are, the higher is the flow resistence. This has a delaying effect on the mold filling time and on the casting quality. For this reason, filter flow sections need to be expanded. In addition, the relevant casting temperature, the filter pore size and the amount of filterable impurities in molten metal have to be considered when selecting the required filter size. Filtered impurities continuously increase the filter flow resistance and they can cause a stall. For this reason it is an advantage in case of larger castings to prepare several casting processes with a filter. On a regular basis, the manufacturer should check their products for durability and effectiveness and to certify durability guarantees relating to casting temperature, height and time for the client. This can be done by using a testing device to measure the flow per time unit and to evaluat the filter state after the casting process (Fig. 3).